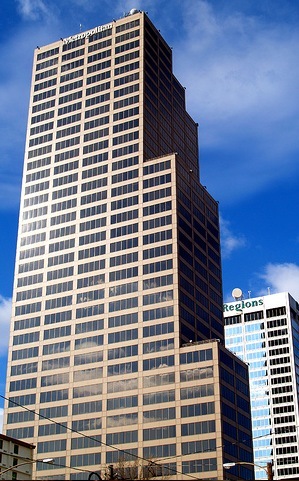 Constructed in 1986, Metropolitan National Bank Tower stands 40 stories and 435 feet tall in Little Rock Arkansas. The Modernist skyscraper, with its aluminum and curtain wall façade, was originally called The Capitol Building. Locally founded frozen yogurt chain TCBY moved into the tower in 1991, and for a time it was known as TCBY Tower. Metropolitan National Bank moved its headquarters to the Tower in 2004 and gave it its current name. They also added the exterior lights that illuminate the tower at night. The colors of the lights are changed frequently in recognition of various national holidays.